I just wrote a blog at SearchHub about "Multi level composite-id routing in SolrCloud". Here's a link to that: https://lucidworks.com/blog/multi-level-composite-id-routing-solrcloud/. 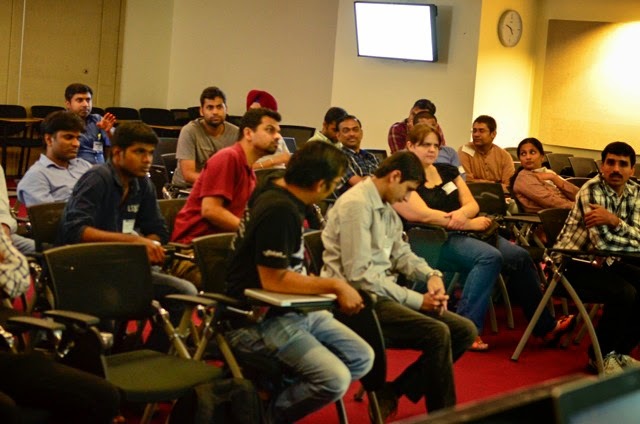 We just had the third Bangalore Apache Solr/Lucene meetup this last weekend. It's good fun to see the community grow to 200+. Actually, as I type this, we're already 3 short of the 250 mark. As per the requests from a reasonable number of members, we had a "Solr 101" by Varun Thacker form Unbxd. Right before he leaves for his talk at Lucene Revolution Europe 2013, he did get a lot of attendees both introduced and interested in Solr. His talk was followed up by a talk on a "DIY Bookmarks manager using Lucene" by Umar Shah from SimplyPhi, Bangalore. It was a nice demo and I'm sure this would have again motivated people to try out similar DIY stuff using either Lucene/Solr. 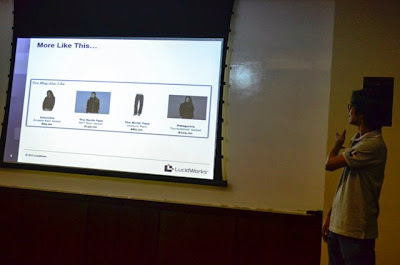 This was followed with a talk by Ganesh M from Dell Sonicwall. 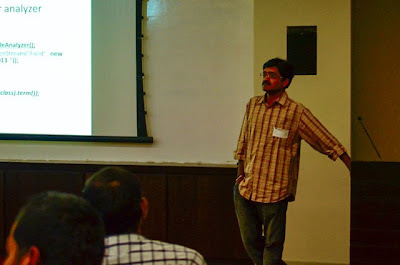 Ganesh gave a quick talk about "Building Custom Analyzers in Lucene". A short and quick take on a complex but interesting part of Lucene certainly got the advanced users interested. 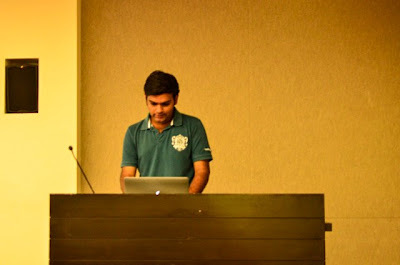 After his talk, with the last talk, I spoke about "MoreLikeThis in Solr/Lucene". I started off with some history on the current MLT stuff and how it really works along with what are the kind of issues that people are known to run into when using this feature. I also spoke about a MoreLikeThis QueryParser for Solr that I've been working on as a part of my official work at LucidWorks. We plan to Open Source it as soon as I have time to put it out and document it a bit. This may well be the last meetup I'd organize and attend in Bangalore for the year. 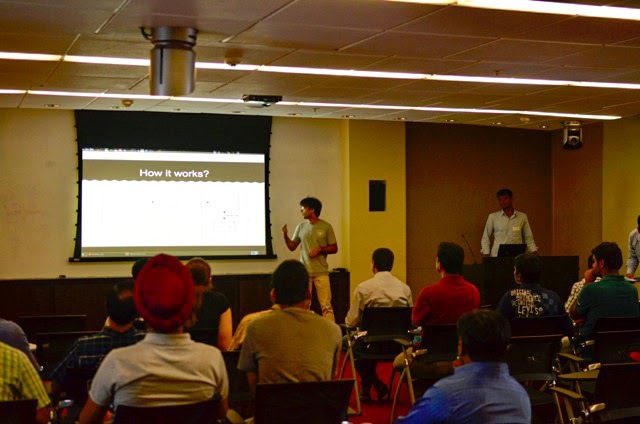 Good luck to Varun and Shalin for organizing this going forward. Thanks to Microsoft Accelerator for giving us the venue to host the meetup yet again. 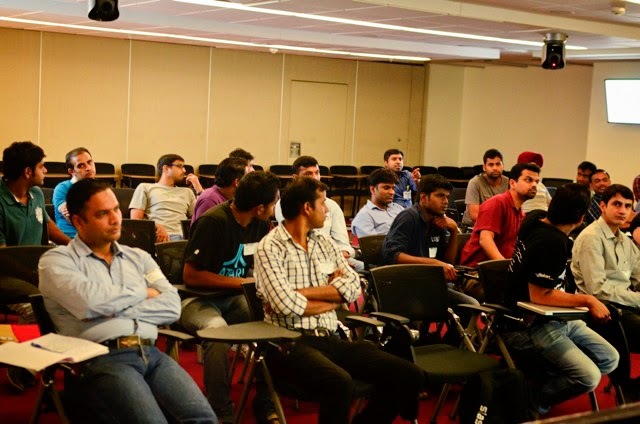 It's one of the most centrally located and well equipped spaces in Bangalore for such meetups. 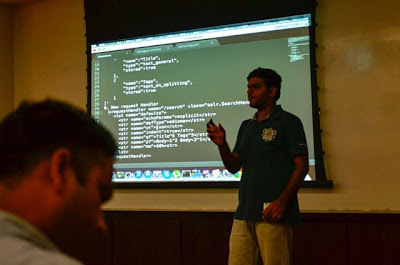 In case you'd like to join the meetup group and be a part of the active community, here's where to do that: http://www.meetup.com/Bangalore-Apache-Solr-Lucene-Group/ . One of the many features that have come out for SolrCloud has been collection aliasing. As the name suggests, it aliases the collection, in other words gives another name or a pointer to a collection (which can be changed) behind the scenes. Among other things the most important uses of aliasing a collection could the power to change an index without having to change or modify the client applications. It helps in disconnecting the view from the actual index. So let's see how can we practically use this feature for rather common stuff. 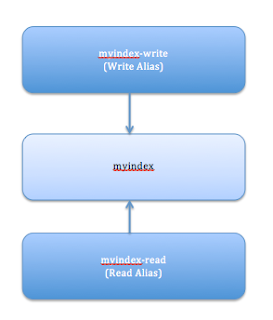 Switch the write alias to a new index. Start re-indexing using the index update client that you use. That way you never change the name/alias but behind the scenes, all the updates go to a new index. 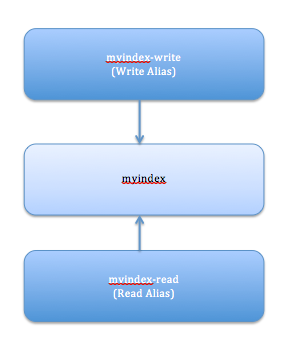 Once the re-indexing is complete, change the read alias to use the new index too. An existing alias can be updated with just a fresh CREATEALIAS call with the new alias specifications. Secondly, the collection aliasing command lets users to specify a single name for a set of collections. This comes in handy if the data has time windows e.g. month-wise. Every month can be a collection by itself and things like last-month, last-quarter can be aliases of appropriate months. It can also be useful when the data gets added e.g. in case of travel/geo search. A continent could be an alias, consisting of collections holding data for certain countries. As data for other countries from the continent comes in, you may create a new collection for those countries and add those to the existing continent aliases. There's no limit as to what aliasing can be practically used for as far as use cases are concerned, but hope the ones mentioned above help you get an idea of what aliasing is broadly about. MongoDB (from "humongous") is a scalable, high-performance, open source, document-oriented data store. I was happy using MongoDB and my very own search engine written using/extending lucene, until the trunks for Solr and Lucene were merged. This merge translated to Solr using the same release of lucene that I was using, unlike the past when there was some disconnect between the two. I realized that a lot of what I was trying to build was available through Solr. Though Solr is used by a lot of organizations (which can be found here) and I'm sure that at least a few of them using Mongo, for some reason there was/is no straight forward out of the box import handler for data stored in MongoDB. This made me search for a framework/module/plug to do the same, but in vain. All said and done, here's a way that I finally was able to index my mongodb data into Solr. I've used SolrJ to access my Solr instance and a mongo connector to connect to Mongo. Having written my own sweet layer that has access to both the elements of the app, I have been able to inject data as required. This will get you started on your track to index mongo data into a running Solr instance. Also, remember to configure Solr correctly for this to run smooth. Search engines are a lot about precision, recall and speed. These three factors pretty much define the quality of a search engine. I'd only talk about the last point here, speed. The time taken to search for a search engine is such a critical factor that an improvement of a few hundred milliseconds is of extreme importance to anyone associated with developing/designing search engines. More often than not, as a short term gain, all of us look at putting in more money on the hardware to improve a system's performance. Though this might look like a solution, its bound to fail if you try to run away from actually fixing the application architecture, which happens to be the root cause for poorly performing applications generally. For those who have already done whatever it takes to optimize the search process, here are a few ways that are generally used to host the search index on the RAM, in order to improve the search speed. You may mount a tmpfs/ramfs on your machine and copy the index on it. You may then open index reader/searcher on this copy of the index. This would help in reducing the I/O latency and improve the search speed. ramfs will grow dynamically unlike tmpfs which is static and initialized with a fixed size. tmpfs uses swap memory whereas ramfs doesn't. I have personally used tmpfs and it works rather efficiently. One thing to remember is that both tmpfs and ramfs are volatile. They both get erased on a system restart and hence you'd need to re-mount and copy the index on system startup. The other approach in case you're using lucene is to have the IndexReader use a Ram Directory. In this case you'd need a JVM instance with enough memory to load all of the index contents into memory and have more for processing search queries. Also, that may translate to 'requiring'a 64-bit JVM so that it could use pseudo unlimited address space. All said and done.. don't stop optimizing the engine/app if your search is slow.. 99% of the times.. that is where it has to be handled.